Today, this handsome Palladian country house stands in nearly 40 acres where guests are free to wander about the elegant lawns and parkland to enjoy the exceptional peace, tranquility and majesty of the grounds. The interior features a wonderfully comfortable drawing-room with magnificent Adamesque plasterwork, many fine antiques and a large open fire. 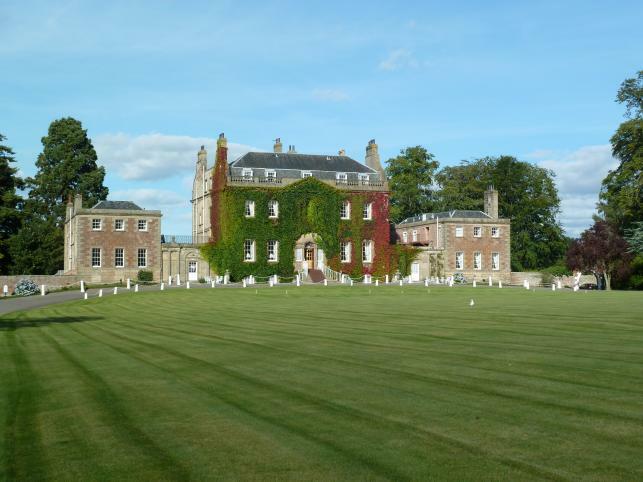 Culloden House is rated STB and AA four stars and two Rosettes for food. Member of 'Taste of Scotland'. The warm Scottish Highland welcome you will receive at Reception will only be enhanced by the awesome sight of one of our magnificent crystal chandeliers and fine Adam's plasterwork. Our handsome baronial Forbes Room with its beamed and chadeliered ceiling, Royal Stuart tartan drapes, rich oak paneling and marbeld fireplace adds a special feel and dimension to your meetings, private dinners and wedding ceremonies. Choose to dine or meet privately in the elegant Morning Room with its ancient fireplace and south facing view over the beautifully kept lawn. This room has a special warmth and intimacy all of its own. The Library is the ideal place for intimate conversation. Relax in a wingback chair by the fire and enjoy the warm ambience of this south facing room with an after dinner drink and quality cigar.